Rice in Arabic is called A’ruz, but in the majority of the Gulf states nobody calls it by its proper Arabic name and instead refer to it as Aish (3aish), which literally means “the state of living” or “life”. 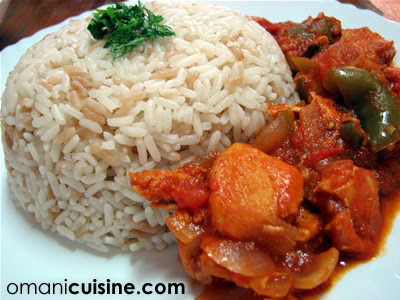 Rice is a principal element in the Gulf diet and it has to be served for every-single-lunch-meal. Many nationals in the area will not consider a meal they eat around noon time without rice a ‘lunch meal’. It is interesting to notice the distinction between the naming convention of rice based meals in Arabic and English. In English, the meal is called ‘something and rice’ while in Arabic Khaleeji dialect, the rice always comes first, it is Aish wa Laham (rice and meat), or Aish was Samak (rice and fish). Another interesting fact is the different usage of the word Aish in other Arabic states, such as the Mediterranean Arab states and Egypt, where Aish means bread and not rice, as bread is the principal element of of the majority of the meals served there. Our dish today is a very basic ‘aish’ meal, check out the ingredients and method on how to make your own ‘aish’. Put the chicken in an oiled heated pot and stir until it turns white then add salt, pepper, and mixed chicken spices. Add the onion, capsicum, tomato, garlic, and chili to the mix and then stir and leave for 5 minutes. Add the tomato paste and a mug of water. Mix and add the juice of the lemon. Lower the heat and leave for 15 minutes or until the chicken is cooked. You can add more water to the chicken if all the water in the pot evaporates and the chicken is not yet cooked. Add only a quarter of a mug of rice to an oiled pot and stir until the rice turns brown. Add the rest of the rice to the pot and add 3 mugs of water. Add salt to it, stir well, cover and leave for 20 minutes on low heat. Remove the pot from the cooker and leave on the side for 5 minutes before serving.